Washington is trying to avoid dropping to seventh so that it can avoid the Heat in first round of playoffs. The Washington Wizards downed an undermanned Miami Heat 114-93 on Monday to hand the Indiana Pacers the top seed in the Eastern Conference. 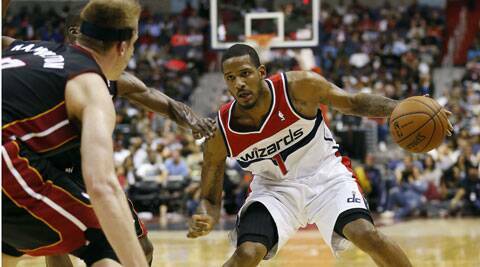 The Miami Heat opted to rest LeBron James and Chris Bosh as Trevor Ariza scored 25 points for the Wizards, who shot 59 percent and made 14 3-pointers and remained one game ahead of the Charlotte Bobcats in the race for the East’s No. 6 seed. Washington is trying to avoid dropping to seventh so that it can avoid the Heat in the first round of the playoffs — when LeBron and Co. will be back. Michael Beasley scored 18 points for the Heat, who will be the No. 2 seed when the playoffs begin this weekend. Charlotte’s Chris Douglas-Roberts dribbled into the lane and sank a short jump shot as time expired as the Bobcats overcame a 15-point deficit in the final period to beat the Atlanta Hawks 95-93. Al Jefferson had 27 points and 15 rebounds for Charlotte, which remained one game behind Washington in the race for the sixth spot in the Eastern Conference playoffs. Gary Neal had 17. Jefferson’s turnaround jumper gave the Bobcats a 93-91 lead before Lou Williams answered with a tying jumper for Atlanta with 2.6 seconds remaining. Following a timeout, Douglas-Roberts penetrated and lobbed the soft jumper as the buzzer sounded. The Hawks rested starters Kyle Korver, Paul Millsap and DeMarre Carroll. Mike Scott led Atlanta with 20 points. At Toronto, Greivis Vasquez scored 25 points and Kyle Lowry had 24 as the Raptors set a club record with their 48th win, beating the Milwaukee Bucks 110-100. Jonas Valanciunas had 14 points and 13 rebounds, and Tyler Hansbrough had 12 points and 11 rebounds as the Raptors won for the sixth time in seven games and completed the first season sweep of Milwaukee in club history. Ramon Sessions scored 21 points, Jeff Adrien had 19 points and Brandon Knight 18 as the Bucks lost their 14th straight road. The Memphis Grizzlies clinched the final playoff berth in the Western Conference with a 97-91 victory over Phoenix that eliminated the Suns from postseason contention. Zach Randolph scored 32 points as the Grizzlies scored the last six points of an intense fourth quarter. Markieff Morris had 21 points, and Channing Frye and Dragic 14 each for Phoenix. Michael Carter-Williams had 21 points and 14 rebounds, and Tony Wroten scored 20 points as the Philadelphia 76ers beat the Boston Celtics 113-108.